See YouTube video - Aggressive Defence. A warm-up drill, four attackers with two balls, four defenders. 1 and 2 make skip passes, X1 and X2 must be there on the catch (on-ball and help positions). 3 and 4 do the same with X3 and X4. Continue, flip players. 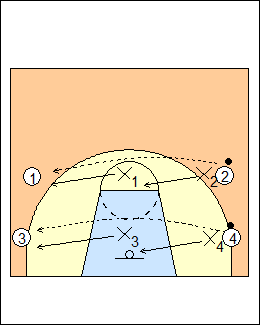 See Defending - Continuous closeouts, Skip pass 2 on 2, Izzo jump to the ball, 2 on 2 shell, Schepp closeouts.